My collection of my own hair grows. What will become of it I am unsure. Strands unleash themselves as my hair is unwound at the end of the day. They are tucked carefully into my notebook or the jar that holds its sisters. In bathing three or four strands come away in my hands and I twist them wet on the rim of the bathtub. Looped and twined each strand a story lived though unspoken. written in cursive by the body. 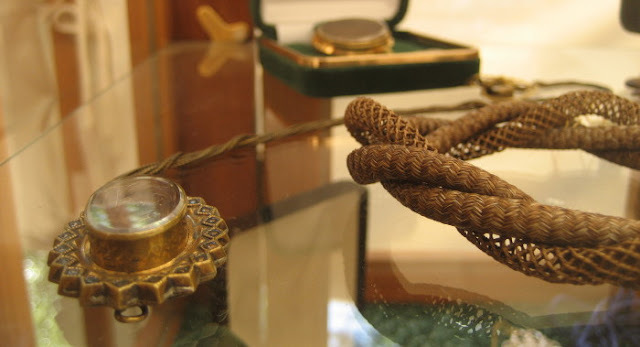 Last April while wandering a Civil War period general store, these pieces of hair jewelry caught my eye. Such delicate work was made like bobbin lace, pinned to a pillow weighted on the other end and woven bit by bit. 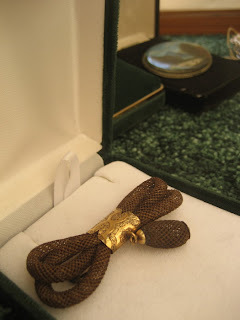 Such work was most popular during the Victorian era as a momento mori, made with the hair of the deceased to be worn in remembrance of them. In the States sometimes it was made or commissioned by a living woman to send with her sweetheart when he went off to war in leiu of a coveted photograph or painted portrait. I found this article on the taboos and strange practices surrounding hair. I like the idea of embedding each hair into a page and binding it as a book. Maybe some day far into the future people will find the book and read something from the DNA left in each strand. Love the way you wrote about your hair. Beautiful! I'm quite jealous of your hair collection, you having long hair. I've been collecting for ages, but my hair is now very short and as I've got the idea of knotting a ladder from it at some stage I've got my work cut out. And thanks for the link to that article on hair - will print it out. (Left an answer to your comment right under it). Miss Liz, I thought that too, a thousand ways to read the same thing. Periodically, I consider the idea of having short hair until I realize I'd miss the the perpetual hair factory. 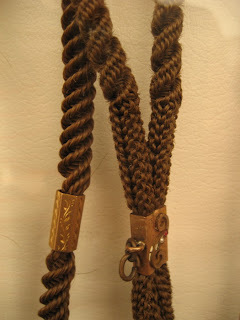 I love the idea of a knotted hair ladder hung or draped, wonder if it would be for climbing up or climbing out? Thank you for the supportive words.